Auctioning off street art. A concept that felt so distant to the artist who choose the streets as a place with which to socially identify. A move from the streets to the galleries that increasingly brings together art curators, foundations, and obviously the art market. 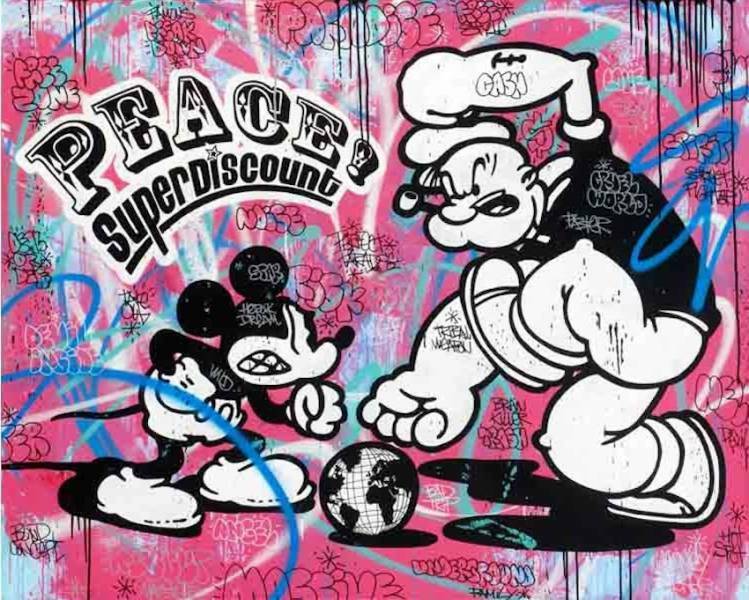 From February 12th to the 15th, FAAM, an auction house specializing in street art, modern art, impressionism, and contemporary art, organized the third edition of the street art auction that put on sale the works of artists of different generations and different styles and techniques. 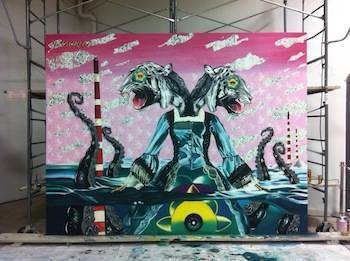 Amongst the most famous figures, Ron English, Keith Haring, Crash, Faile and much more. “Creativity comes from diversity! FAAM is the product of the conjunction of different entities: its birth is European: from Paris, the birthplace of founder Frederic Thut, to New York. Frederic is the director of Fine Arts Auctions Miami and has been an auctioneer for over 30 years, and an expert of french impressionist art. He moved to New York ten years ago but maintained a base in Paris with some partners”. “The auction house is based in Miami but we have offices in New York and Paris, and this year more than ever, we felt compelled to include European artists”. New York is the city where graffiti were born and where the evolution of street art is being held today as a way of redefining territory. Miami is a culturally rich and diverse city, where we can breathe a latin air, which mixes into the other cultures present: creativity is the result of this alchemy”. Sofia Caputo tells us, the European Evaluators LLC for FAAM. 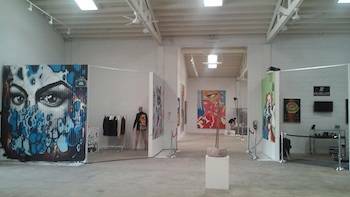 The auction took place in Winwood, the neighborhood known as the heart of Miami street art, inside the immense and luminous industrial space Spaceby3. The 65 lots decorated the huge and heavy walls of the location where workers, collectors and street art lovers had the chance to observe the street artists at work live. The three days preceding the auction were filled with panels and artistic performances, which called to the stage the international “guests” called in from Europe to paint. 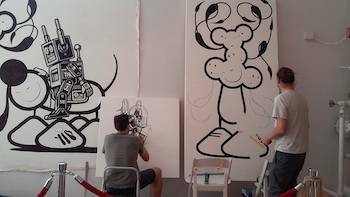 They were given very big canvases, reminiscent of street walls, to show the public their artistic talent live. “The idea to create a form of interaction between the community of Miami and the European community proved successful. In fact, not only the big celebrities but also the local Miami artists were called to paint” Sofia goes on. Also there was the Italian Iena Cruz, based in New York, with an epic and surrealist design made of lively and bright colors, featuring a woman-tigress disturbed by the melting of glaciers. The brand Limoncello Arvero created by Diego Rodinò di Miglione, couldn’t be missing from the list of sponsors. It was created “partly for for entertainment, partly as a game, and the result is delicious. We Italians are used to drinking limoncello as an “ammazza caffe” (coffee killer) after dinner, but in America habits are different so we invented cocktails that fit different contexts” concludes Sofia Caputo. 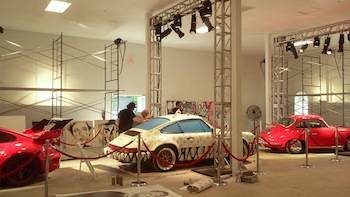 Beautiful vintage porsches were made available to be painted and Chris Brown (aka Konfuzed) collaborated with KAI to create seven pieces including the hoods of two of the Porsches. 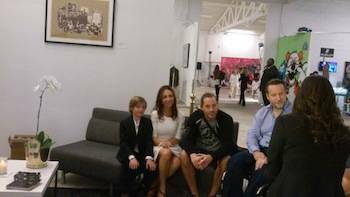 But a priority for FAAM was also to raise funds for two charities of Miami: the Arts & Business Council, of which street art specialist Sebastien Laboureau is a part, and Guntram Von Habsburg Foundation, for which 290,000$ were raised. Charity founder Guntram Von Habsburg briefly tells us the story of his foundation: “This art charity tries to help through art people with disabilities who find themselves in situations like mine. We’ll start with Uruguay because that’s where I’m from even though my family is European. Above all, with these funds, I want to help people with disabilities and I want to make them understand that life can go on and that they can have a family”. Guntram is in fact always accompanied by his beautiful wife and two children, who support his work. “Someone to take example from is the Italian Andrea Stella, who autonomously drives a seawind catamaran, from which he conducts sensibilizing campaigns on behalf of the Onlus he founded called ‘Lo Spirito della Stella’”. 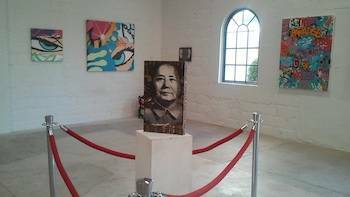 “For me Art is emotion and I find street art in particular to be a driving force in this art charity. Many partners supported me and FAAM. Amongst them Clement, the Rum brand that got street artists to design the decorations for a bottle, and the swiss watch brand Hublot, with which we have already worked in the past”. These sponsors have strong ties with art and street art and the stand of Hublot is a great example of this: Steven Slaughter tells us about the two paintings they have hanging, depicting the icon of the Ferrari horse, with the quadrant behind it. He then shows us a massive watch also made by Maranello’s company, with a small ferrari icon on the side.